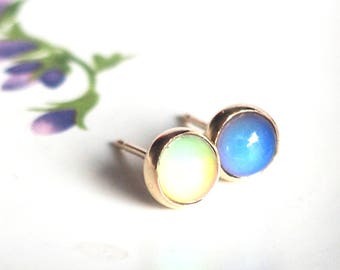 Mood Rings & Mood Jewelry. Handmade with love. All jewelry is completely handmade by me. I have been making and selling mood jewelry for over 10 years! 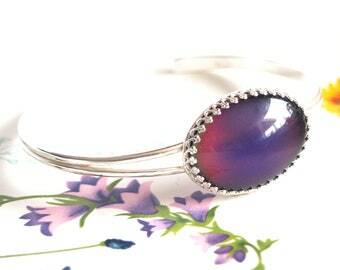 You won't find stones just glued into a pre-made setting here! All my mood jewelry comes with a guarantee. If your mood jewelry stops working, I am happy to replace the stone for you, at any time. No other mood jewelry seller offers such a guarantee! You choose your shipping method at checkout, but remember that you are choosing the speed of the post office, not the speed at which I make your order. My current turn around time is 1-2 weeks. Domestic orders are shipped First Class, which is 2-5 days, or you can choose Priority, which is 1-3 days. But please remember I am located in Alaska and it may take an extra day or two to reach you! I try to ship out your purchase very quickly. 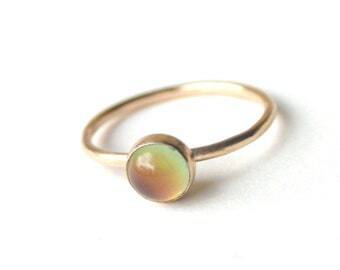 Please allow 1-2 weeks for custom made pieces (if you give me a ring size) to be made and shipped. ©2006-2019 Proteales™. All Rights Reserved. All images, photos, and content of my listings and items are not to be used without express written permission or consent. 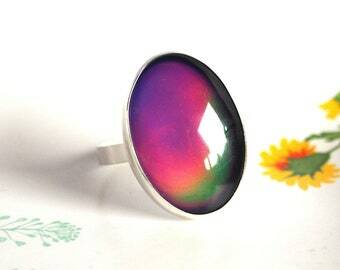 I do love the size and many colors of this ring. Lovely silverwork too. 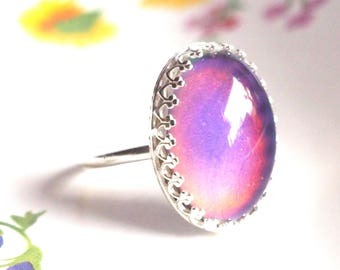 Gorgeous ring that turns all sorts of colors. Love it. Get any size you need! From size 2-14, including 1/4, 1/2, & 3/4 sizes! 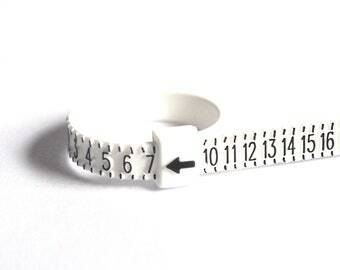 Made to perfectly fit your finger. 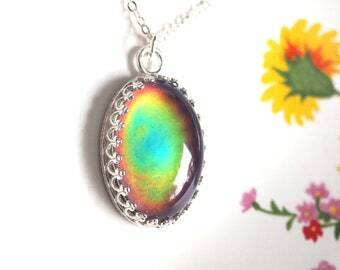 A of colors for your neck! Ever present while I am working, my Pit Bull, Gunner. I got into making jewelry at an early age. My mother used to make rosaries for our church. I remember being fascinated by all the pretty colors and being amazed at a final product. My dad was a rockhound and would take us kids along when going to gem shows. These shows not only gave me beautiful things to look at and discover, but also little tidbits of knowledge that are still rolling around up there somewhere. He was a budding lapidarist, so we had a basement full of big hunks of precious stones and rocks as well as loud machinery. I loved going downstairs just to open drawers and see what treasures were hidden there. I inherited the jewelry making bug as well as all the equipment. For the most part, I am a self-taught metalsmith. My shop has become a tribute to the loved ones who always supported and loved me. A lot of my pieces are inspired by my memories and experiences with those people. Every piece of jewelry is designed, developed, created, photographed, packaged and shipped by me in my Alaska studio. Proteales is a one woman show built from the ground up! What started as a hobby I played with in my spare time at the kitchen table has grown to a full time business. I couldn't be happier! I wear too much perfume. I own too many boots. I drink way too much tea. I listen to my music a little too loud. I was born in West Virginia, but I now live in Alaska with my husband and a sweet little Pit Bull named Gunner. 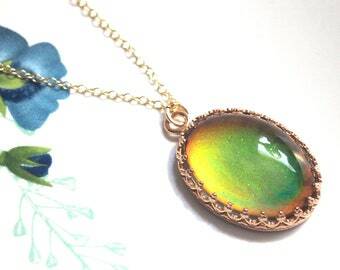 There are so many lovely things to browse on Etsy and I truly appreciate your interest in my work. All items will are packaged in a pretty purple gift box and velvet bag. 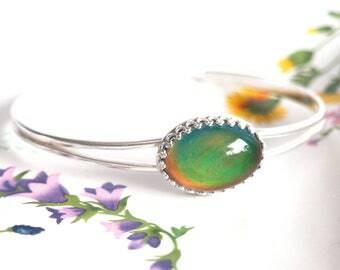 Perfect for gift giving or giving the perfect gift to yourself! If there is a problem with your order, PLEASE contact me before leaving any feedback, negative or positive. I've ordered enough off of Etsy over the years to know that things happen. Packages get lost, get damaged or even arrive empty. Please let me know if you are less than satisfied with your order. I do not offer exchanges on any items. If you are unhappy with your purchase, I would be happy to either refund your money or make another for you. 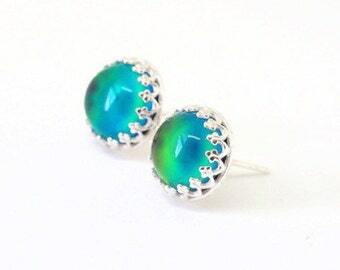 You can return any unused, unworn jewelry (earrings) within 5 days of delivery confirmation. 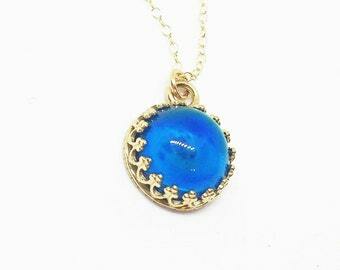 All mood jewelry comes with a guarantee on the stone and I am happy to replace any time. Original shipping costs are non-refundable. You are responsible for the shipping the unwanted item back to me. Shipping cannot be refunded. 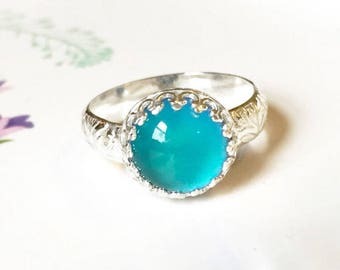 Please contact me prior to sending back your jewelry (and wait for a response), otherwise it will be refused and promptly returned to sender. I have specific shipping instructions that I will give you. DO NOT throw your jewelry in an envelope and send to me. 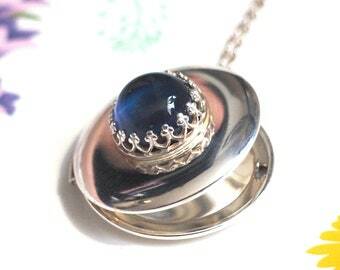 This is a sure fired way to lose or damage your jewelry. Your shipping envelope is not only made with recycled materials, it is recyclable AND reusable! You can use it for returns, so please save if you are planning on returning your item. I will not accept, refund or repair any jewelry that you have tried to repair yourself. Please DO NOT try to repair any broken jewelry with super glue or any other glue you have at home. This will most definitely permanently ruin it and void any guarantee/warranty I am offering. 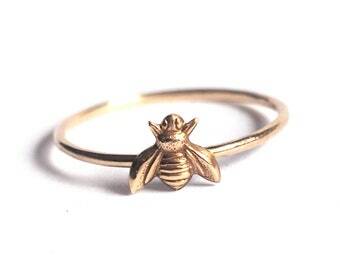 If you need a ring that you purchased from me re-sized, I am happy to do this. There will be a $10 charge for sterling and $20 for gold. 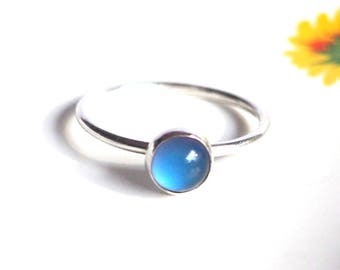 I do not re-size rings not purchased from me. I do not work with customer's stones or materials due to liability reasons. In the interest of conservation, I do not provide printed receipts. This information is available to you within your Etsy and/or PayPal accounts. I try to ship out your purchase very quickly. Most READY TO SHIP items are mailed within 48 hours. Please allow 1-2 weeks for custom made items (i.e. you gave me a ring size). Usually it is much quicker than this, but it can take up to 10 business days for your item to be made and shipped. You will receive an email with a tracking number when your package ships. Please check your spam folder if you do not receive it. You choose your shipping method at checkout, but remember that you are choosing the speed of the post office, not the speed at which I make your order. All mood jewelry comes packaged in a signature purple box that is made of recycled paper and is recyclable! A soft purple velvet bag is also included to store your jewelry in. 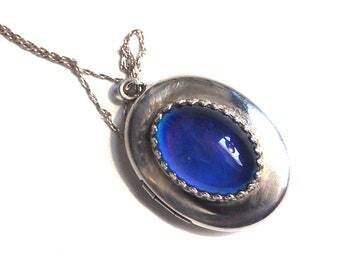 This will keep it safe and protect from tarnish, hang onto this! International customers, your package will be shipped via First Class International. Please allow 1-4 weeks for delivery due to customs. Also please know what your country's import restrictions are from the US and understand that I am not responsible for any customs fees, duty fees, or applicable taxes on international purchases you might incur. Since you paid for this item, it is not a gift from me to you and cannot be marked as such for customs. Claiming merchandise as a gift to avoid customs fees is illegal and as stated in my shop policies, here on your receipt and your shipping notification, it is the buyers responsibility to be aware of these potential charges. I apologize, as it is unfair for other sellers to not follow the rules. If you choose Express Shipping, it still takes time for me to make your item, I will do my best to get it out to you with 48 hours. I cannot guarantee a time frame of shipping items Express. USPS can take an average of 2 days for their "Express" so any shipping fees will not be refunded due to shipping delays out of my control. If you need to contact me about your order, please do so through Etsy conversations. If you email me, I may not receive it as my inbox fills up quick and my spam filter is strong! If you have a special request or need to select a color, size, etc. of you order, please let me know in the 'message to seller' box at checkout. READY TO SHIP items cannot be adjusted, unless it is something you have contacted me about prior to purchasing. If you need to get a hold of me for any reason prior to checkout or post-checkout, please contact me through Etsy conversations. If you email me, it has a good chance of not even being seen! 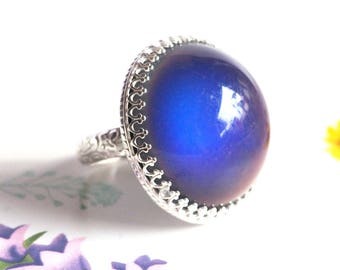 Do mood stones really respond to my mood? 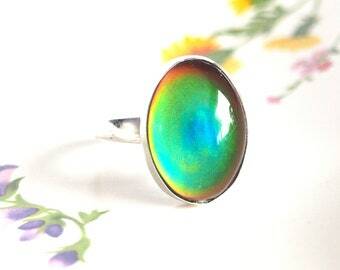 The 'stone' of a mood ring is really a clear dome containing thermotropic liquid crystals. The crystals respond to changes in temperature by twisting. The twisting changes their molecular structure, which alters colors that are absorbed or reflected. 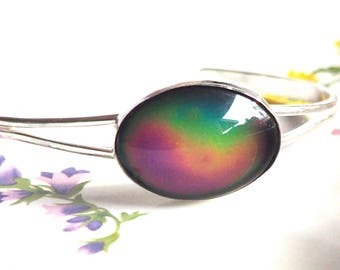 So when the temperature of the liquid crystals changes, so does their color. 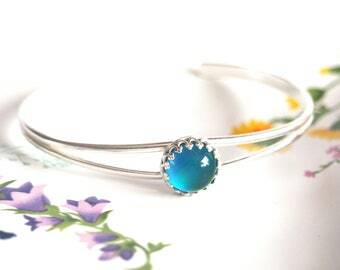 All sterling silver will over time tarnish (darken) as it is exposed to the air. Simply use a polishing cloth, as gentle rubbing and buffing alone will remove tarnishing. Polishing cloths are ideal as they are impregnated with a polishing compound, last a long time and give an amazing shine. Sterling silver is best stored in a cool, dry place (heat and moisture speed up the tarnishing process), NOT in your bathroom! Try adding a piece of white chalk to your storage area. I do not recommend you use any jewelry cleaner on mood jewelry as this will damage the stone. 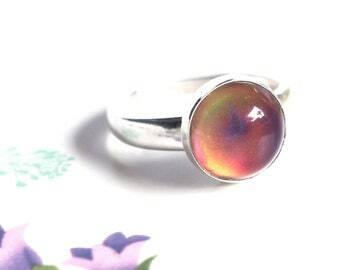 I have been selling my mood rings for 7 years and have had one customers finger turn green. 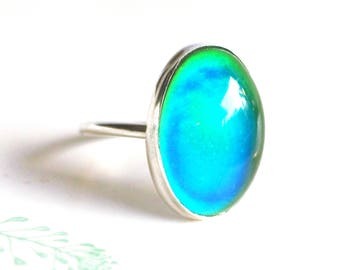 Certain metals can turn your finger green due to a combination of the metal and the acids in your skin. 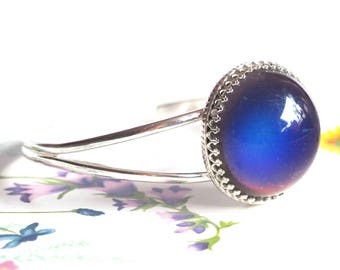 Sterling silver is 92.5% pure silver, with the remaining 7.5% made up of other metals, usually copper. Some people react more to copper than other people, due to a chemical reaction with moisture on your skin and the alloys in the metal. Even silver & gold jewelry can produce a reaction in certain people. 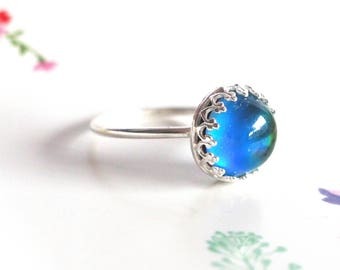 If you are one of them, you will greatly reduce the chance of any ring turning your finger green if you take care to keep soap, lotions & other chemicals away from your ring. 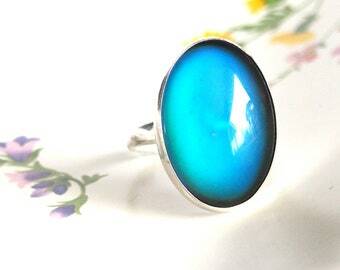 Remove your rings before bathing or swimming, especially in saltwater.